AIM Director Nancy Tam’s Water-Wise Garden won the 2014 National Environmental Achievement Award and the 2013 Keep Texas Beautiful Award. Whether she’s tending garden or nurturing her body with AIM BarleyLife®, Nancy keeps the Healthy Cell Concept™ in mind. “I work for a water district. We have a role in educating the public and city officials about water conservation. Ten years ago due to my passion for gardening, I had the opportunity to help my company by installing the landscape around a new facility. In order to save money and for educational purposes, I redesigned the landscape with water conservation in mind, so I used more drought-resistant and native plants. I created three different styles of garden: Japanese, hill country, and English. If I wanted people to copy my Water-Wise Gardens, I had to make them attractive and easy. So I made a datasheet that was like a recipe. “The water-wise garden is totally organic, which makes sense. There is no need to use harmful chemicals. When you’re handling pesticides and herbicides, you can inhale the poison. If you touch them without gloves, they are absorbed into your skin and can negatively impact your body. “Harmful chemicals in the garden are as dangerous as the harmful chemicals one can absorb through food. That’s why we go organic. Using organic products means less disease and fewer allergies. We should apply the Healthy Cell Concept to our environment in addition to our bodies. “Back in ‘89, I got really sick with allergies from pollen and food. I had anemia, hives, migraines, and total fatigue all the time. I went for medical help. I’m a good patient. I did what they told me, but none of them put a focus on nutrition. A friend of mine asked me to see Loretta Shu (Chairman’s Club Director). I almost didn’t. I was so tired. When I met her, there was no sales presentation, just a nice friendly get-together. She told me about BarleyLife. That was a turning point for me. or something else unhealthy, I drank BarleyLife instead. I didn’t expect a miracle to happen, but it did. In four to five weeks, my energy levels were better. It was both so sudden and so gradual that it took me awhile to realize that the BarleyLife was making a difference. One day I noticed that I hadn’t used my extra-strength aspirin in three weeks. I used to eat them like candies because my head hurt so much, but now all my symptoms were gone. Postmenopausal women, the lactose intolerant, vegetarians, people who consume large amounts of alcohol, caffeine, and/or soda, folks with Crohn’s disease or celiac disease, people who don’t get enough sun, those who live in nursing homes, IBS sufferers, the obese, the very dark-skinned, and most people. It may seem like a random list of qualities, but everyone mentioned has something in common. They are all at risk of being either calcium or vitamin D deficient. The body relies on vitamin D to produce a hormone called calcitrol to absorb calcium. That means if you’re deficient in vitamin D there is a good chance that you’re lacking calcium, too. And if you don’t have enough calcium, it may be because you don’t get enough vitamin D.
The good news is that you can get both of these essential nutrients in every scoop of CalciAIM, a great-tasting citrus drink that provides you with everything that you need for strong bones and a healthy body. Apart from skeletal health, optimal calcium levels are important for vascular contraction, vasodilation, muscle function, nerve transmissions, intracellular signaling, and hormonal secretion. A full-grown adult needs at least 1,000 mg of calcium a day. Postmenopausal women and elderly men need 1,200 mg or more. CalciAIM provides 386 mg of calcium per serving, and unlike milk, CalciAIM doesn’t contain estrogen, saturated fat, or lactose. It’s also a vegan source of this essential nutrient. Vitamin D is essential for healthy bones and a healthy heart. According to Medscape.com, most people are deficient in vitamin D. Deficiency in this vitamin has been linked to weight gain and depression as well as breast, prostate and colon cancer. CalciAIM has 70 percent of your daily vitamin D, so there’s no need to go without any longer. 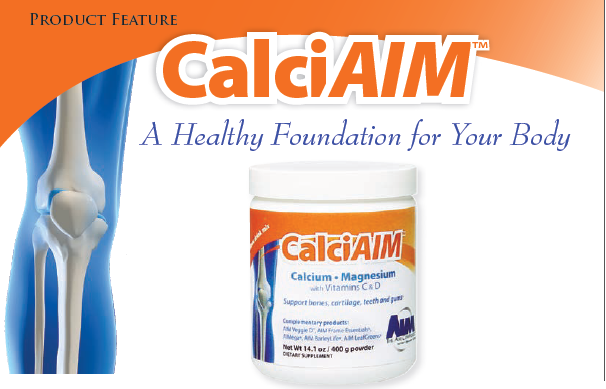 CalciAIM also contains significant amounts of other bone-building vitamins and minerals. It has 30 percent of your daily magnesium. Studies have linked magnesium to increased bone density and the ability to retain calcium. Furthermore, magnesium deficiency (as well as calcium deficiency) is linked to osteoporosis. CalCiAIM contains 54 percent of your daily vitamin C needs for improved immune system health and assistance in the absorption of calcium required for the synthesis of bone and connective tissue. Last but not least, copper (24 percent) and zinc (12 percent) both help stop bone loss. “I was trained many years ago as a home economics teacher and home economist and did get a good foundation. However, the holistic side of nutrition is so different from the mainstream. In the years since, I have studied holistic nutrition through books, DVDs, classes, and seminars for my own health and my family’s. This was how I stumbled upon the AIM products through a friend in the early 1990’s and have taken them myself since that time. The AIM Academy is absolutely free for Members. There is nothing to lose by attending and only everything to gain. The AIM Academy works around your schedule. Complete your coursework at your own pace until you graduate. The AIM Academy is routinely updated with new content, so graduates are always welcome to come back to learn about our newer products and to refresh their current knowledge base. So attend the AIM Academy and learn all you can about proper nutrition, wellness and wealth. Anton Zafir’s first professional bout was in June 2012. In just two short years, Anton “The Professor” Zafir—he has a graduate diploma in exercise and a bachelor’s degree in the Science of Sports—rose to the top of the Australian Mixed Martial Arts scene, winning the the Nitro Welterweight title belt after defeating the former champion by unanimous decision. Zafir is known for a fighting style that “pushes the pace” and forces his opponents into uncomfortable positions where they are likely to make mistakes. He capitalizes on their blunders and turns them into victories. His canny fighting style has netted him a (6-1) record. Anton is as clever outside the ring as he is inside because he knows the value of the whole-food nutrition found in the AIM products. “As the Australian Nitro Welterweight Champion, my training regime is rigorous and intense, and my dietary requirements need to be of the highest quality to ensure recovery and peak performance. I have never been a fan of processed supplements that are widely used without full knowledge of their negative side effects. With this in mind, I researched a great deal to find a healthy, 100 percent natural company that provided top-level dietary supplements. My search finally met with success when I was introduced to AIM a year ago. 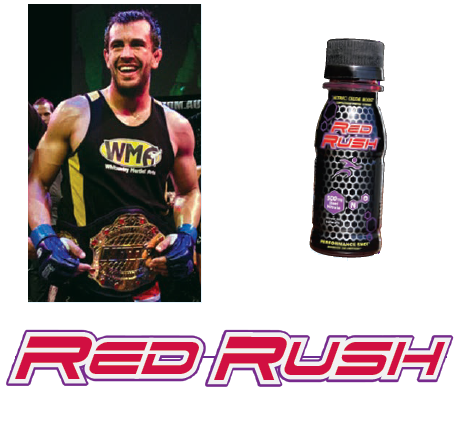 “AIM Red Rush® is my favorite daily drink. It dramatically boosts my energy and endurance for training and competition. “I use AIM Peak Endurance™ for upkeep and replenishment of energy after each grueling training session, AIM Herbal Fiberblend® for removing bodily waste and toxins and the maintenance of blood sugar levels, AIM BarleyLife® for a healthy immune system and energy, AIM ProPeas™ for added protein to repair and build muscle, AIM fit ’n fiber™ for my digestive system because it reduces my appetite while lowering my fat levels and helps to maintain fat loss for competition preparation. I also use AIMega® to attain my omega-3 and -6 essential fatty acids for general health. “Since taking the all-natural AIM supplements, I now work out longer and harder. I recover faster and have suffered less injury; I can maintain and cut weight without starving or depleting my body. I go into training and competition strong and healthy with extended stamina. ...but she made Director on her own. AIM Director Tiki McIntyre of New Orleans has been drinking AIM’s green barley powder since she was a little kid. “I started taking it regularly about twenty-two years ago, but my father, Patrick Ryan, originally introduced me to it as a small child. He was always into fitness and health. He was an AIM Director who made a couple of thousand dollars a month in checks and went to a bunch of conferences like the one in Alaska. We had a hardware store and bike shop. He worked his AIM business from there. If anyone bought AIM’s green barley powder out of the Alexandria area in those days, they bought it from him. All different kinds of people came to the hardware store to talk to him about it. He had a massive downline. One of the things he told me was that ‘You have to have meetings.’ Dad had meetings all the time. Tiki’s grandfather, Jerry L. Ryan, signed up under her father and she still has his briefcase containing old AIM Companies magazines, lots of brochures, and pamphlets with tips on how to take barley powder and caplets. The briefcase even has an old AIM advertising kit that looks like it was printed out on a dot matrix printer. There’s also promotional material that the Member literally has to cut out pictures of the AIM Garden Trio® with scissors. Her sister and her aunt are also AIM Members. “I’m a personal trainer and studied exercise physiology at Louisiana State University. I firmly believe that healthcare problems start with what you put in your mouth and how active you are. If a machine sits out in the field and doesn’t do anything, it gets all rusty. That’s just what happens to your body. “I like to live like a New Orleanian. I like to eat the local foods and have a glass of wine with friends. That’s why the AIM products are so great. I drink the AIM juices and if I want to go out to dinner then I can and I know that my nutrition has been taken care of. I can enjoy life without scrimping around eating celery all the time. The standard American diet doesn’t give people enough nutrition, but with the AIM products, I don’t have to worry about it as much. I don’t have to adhere to any crazy diet plan. Juicing with the AIM products is sustainable and easy. It’s there and it’s done. If I had to do all that juicing and had to clean the juicer and the counters and deal with the rinds and stuff, I wouldn’t do it. I’m too busy. That’s why the AIM products are so great for me. My husband, my kids and I are able to maintain healthy, nutritious diets conveniently. “I’m going to continue the family legacy by passing on AIM to my kids. My husband’s daughter is taking the AIM products. I’m going to sign her up when she goes off to school. She takes BarleyLife, Herbal Fiberblend and AIM Proancynol®. Proancynol really helps her with her allergies. 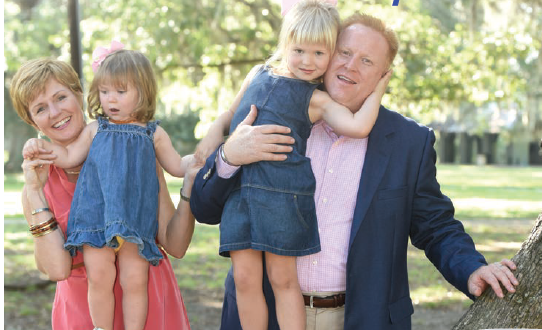 “My kids love BarleyLife. My two-year-old and I were at a member of my downline’s house when she saw a BarleyLife canister there. She near-hyperventilated with excitement, pointing and yelling ‘Yes!’ ‘Yes!’ All my kids love it. I put the Garden Trio powder and a little flour into a bowl and my kids play with it like pixie sticks. They eat it dry. I was at the gym and one of my clients complained about his knee and my daughter happened to be there. She said ‘if you took your BarleyLife, your knee wouldn’t hurt.’ She was three when she said that. Around our house, we don’t drink chocolate milk, we drink AIM CoCoa LeafGreens®. We don’t drink Gatorade, we drink AIM Peak Endurance®. “Nowadays, you have to be vigilant about nutrition. In my grandfather’s time, you just had nutrition—from the garden, snap peas and carrots. Back then, they had to cook. They didn’t have McDonald’s on every corner and trans fat. They used real butter and it was fine. “We’re working with the other moms and the school to limit the amount of sugar at birthday parties. The food they serve at school is substandard. It’s in the best interest of the schools to serve the best foods. Instead they serve fruit that’s been soaking in syrup. They give kids sugary foods and expect them to behave properly and not to crave more sugar. It’s crazy how much sugar is in the food. I could scream it from the mountaintops. My sister’s kid has ADHD and when she takes BarleyLife and cuts back on her sugar intake, it really helps. I am twenty-two years old and currently a child/youth worker student. This is my last year and so I am looking forward to graduation! I am living with one roommate and have an amazing boyfriend who will hopefully in the next year be my husband. I heard about the AIM products through Barbara Bird. She was posting updates on Facebook about health food and products and what they can do. I was frustrated and was about to block her updates when I saw her update about the enzymes and benefits to digestion. The doctors here in Canada had just told me that unless some miracle happened I was going to die by Christmas. Through stress I had worn out all my organs. I had fluid and infections everywhere and surrounding all my organs as well. The damage was quite substantial. For now they could only help me become more comfortable. I was twenty-one and quite honestly I didn’t want to die. There are tons of things I still want to do. desperate to try anything and why worry about the cost when I was supposed to die anyway. I might as well try to help myself and since digestion was one of my issues and stomach pain was so constant, I figured at least get the enzymes. I bought everything I needed for weight loss plus a bit extra. My first order was humongous and it was quite overwhelming, trying to figure out when and how to take all these products. I figured things out and quite frankly, I have never felt so good! I have lost fifty-five pounds using the AIM weight loss products. I decided to cleanse my body using the My Busy Healthy Life 21-day cleanse at around the same time. I have just started the cleanse again. Detoxing from sugar, wheat, corn, milk and other substances made this difficult and the AIM products made me feel good and full. I have so many allergies that being that careful made eating very difficult and I felt like I was on a liquid diet. My favorite AIM product is BarleyLife® Xtra. It has a bit sweeter taste than BarleyLife. I use it twice daily during “snack” time. I put it in a shaker bottle with water. This allows me to actually feel full but also helps me with how much I eat at meal times, too. At this stage I am feeling okay, but I am determined to lose the last forty pounds. I am right in the middle and I definitely plateaued for the past few weeks and have recently just started losing weight again. When I take these products, I feel good. I suffered for over fifteen years with symptoms of urinary tract infections (UTIs). Having been diagnosed with fibromyalgia as well, the years were filled with discomfort whenever I had to urinate and severe pain in my back, legs, pelvis, and kidneys. It was difficult for me to walk or physically do much of anything. My son Daniel, an RN in a hospital intensive care unit, became concerned that I was taking so many antibiotics that eventually they would become ineffective against the bacteria causing the infections. He was right. Over time, nothing helped to stop the recurring UTIs. I was so discouraged, depressed, and tired of having no relief month after month, year after year. I mentioned my health problems to my Destiny Church friends, Yoli Huron (Star Sapphire Director) and Marta King (Group Builder). They encouraged me to try AIM products, sharing several testimonials of Members who experienced relief from pain and improved their health. 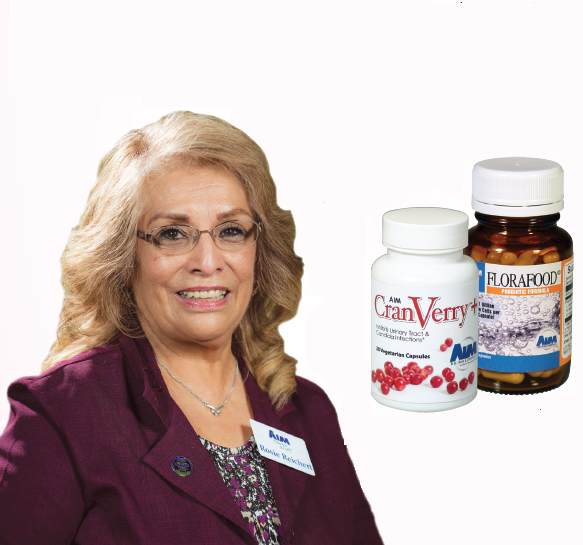 In December 2011, I began taking AIM BarleyLife® and AIM Composure®, and later added AIM CranVerry®+, specifically for the UTIs, and AIM FloraFood®, for the healthy bacteria that I truly believed helped me so much. Within two months, I began to feel the positive effects of taking these natural supplements. Today I am free from UTIs and doing so much better with the fibromyalgia. Thank you, Jesus, for leading me to AIM products through my friends at Destiny Church. I am also so grateful for Dr. Yu-Shiaw Chen (Chairman’s Club Director), who has given me so much inspiration through her webinars and private classes in Stony Brook, New York. I call her book, Healthy Eating Wholesome Living, my healthy Bible. I am taking AIM fit ’n fiber™, AIM ProPeas™, and AIM GlucoChrom™, and I have lost thirteen pounds. Dr. Chen encourages me to continue with my goal to lose weight. On a final note, I thank AIM for giving us all the best products ever because they do give results.